How did I become such a target for pyramid schemes? Is it the unemployment? It’s like I have a giant sign on my forehead that reads, “yes, I would love to partner with you to sell the latest space-age product that could save my life, and in the process receive triple-digit returns on my money and never work again, except for all the selling.” In the last few weeks, multiple organizations have contacted me with promises of success and riches if I join up. All I have to do is take my place at the bottom, sell a lot of stuff and then get some people to sell it for me. The offers always seem a little suspect. To be fair, the business models of the companies contacting me suggest a Multi-Level Marketing (MLM) rather than a pyramid structure. The line between the two can be fuzzy. My good friend Wiki P. Edia – knower of all things… kind of – explained the difference over coffee earlier today. 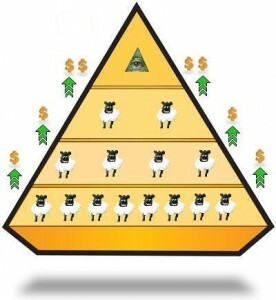 People make money in pyramid schemes by enrolling others, who then enroll still others; no good or service is sold. The business model is non-sustainable and illegal. MLM organizations have a similar structure, in that members create networks of people below them from whom they may earn commissions. The difference is that members of MLM companies sell a real good or service, and the companies are legal. Those who approach me seem to like what they’re doing, or they’re mainlining caffeine and happy pills. Either way, enthusiasm can be infectious. It always makes me interested in what they’re saying and why. Within about two minutes of meeting, they hit me with the vague notions of financial freedom and personal satisfaction – common selling points of most pyramid/MLM schemes. Those who have honed their craft might turn it into a question like, “would you like to make lots of money and set your own hours?” Approximately 1.7 seconds later (0.8 if I’m also mainlining caffeine) I realize that I am being recruited. A project for a former employer involving a popular pyramid/MLM-structured company gave me a keen eye for this sort of thing. If I were as quick and clever as wifey, I might reply, “I prefer the desperate life of a corporate peon, slaving away in the firey pits, thank you very much” or “f**k off, weirdo.” But I’m not. The rest of the conversation becomes a desperate search for a way out. I usually don’t find one. This company can be your vehicle for financial freedom and a lifetime of satisfaction by helping others. In addition to using and sharing the “no-compromise” high-quality cleansing, nutrition and skin care products, the Isagenix Team Compensation Plan provides a logical and rewarding pathway to a better financial future. It rewards your personal efforts and allows you to leverage your time while helping others achieve their success. The plan is generous and provides a substantial income earning potential. The products may work, or they may not. I have no idea. But the system set up to sell them is definitely MLM. And the guy at the event was pretty relentless. He had my business card before I knew not to give it to him. It was a networking event after all, I was throwing my business card at everyone within 1000 feet of the place. He tried to persuade me to join his team, become part of his family as it were. I even watched at his insistence some of a crazy video of the founder talking at me in front of a while background. After multiple phone conversations and some talk about a freelance project, he stopped calling. Given the professional nature of the correspondence – never mind the grammatical nuance, punctuational mastery and convincing calls to action – I immediately sold my apartment at the market rate ($24) and joined. The company is called Tahitian Noni International, and they appear to also sell various dietary supplements. Again, who knows if the products actually work? I saw your interveiw on NY1 News.I also visted your blog. I’m currently working with a group of professional people.We are introducing a new business concept in the tri -state area making multi streams of income. I would like to set up an appointment with you today. This website will help you discover how to generate a significant LIFETIME residual income from the comfort of your home. You don’t have to leave your house to get this information; there are many different ways to get the information. There are phone calls, live and recorded webinars and live meetings. That copy is way more convincing than all those late-night infomercials I record and run on a loop all day to test my tolerance for pain. And the nature of the business opportunity seems promising. I immediately bought back my apartment and sold it again (this time for $17) to raise the membership fee. Watch out world, here I come! To answer the questions I posed at the outset of this post, unemployment has to be the reason I’m targeted. An MLM recruiter assumes that I’m looking for a money-making opportunity, and rightfully so. Depending on the length of unemployment, one may even feel desperate and a little down on their luck. A recruiter might also assume that unemployment has left the job seeker disillusioned with their job prospects and career in general… still another reasonable conclusion. People in this frame of mind are willing to give an opportunity the benefit of the doubt. We want something – anything – to work out. And we’re really trying to find it. But we’re not blind, and we’re not stupid. Ridiculous products and ridiculous promises may pay your bills, but they won’t pay mine. Find someone else to bother with this nonsense. This was written by Norm. Posted on Tuesday, April 14, 2009, at 11:15 am. Filed under Career Advice, Job Search, Networking, Unemployment. Tagged Isagenix, Jobless and Less blog, multi-level marketing, NY1, pyramid schemes, Tahitian Noni International, Ur Residual Ncome, Wikipedia. Bookmark the permalink. Follow comments here with the RSS feed. Both comments and trackbacks are currently closed. When I posted my resume on one of the major job boards, I received numerous phone calls and emails, exhorting me to join up as an life insurance salesperson, also got offers to join/invest in multi level marketing ventures….I felt as if the sharks were circling…. Whatever you do, don’t post your resume on Craigslist.org! I put my resume on there less than a week ago for the Chicago area, and have been hit with “business opportunities” at the rate of about 2-3 an hour. The best one of the bunch is the one that says you are to receive money from this person’s family member, cash the check, put it in your account, then forward the money to the UK. Oh, they want your bank account number too! I wonder how many people fell for that one?